I’ve enjoyed my time with the beautiful, characterful R nineT Racer. When I took possession of the bike I wanted to accentuate the ‘Racer’ part of its character. My idea of heaven on a motorcycle is fast, flowing road riding, combined with a bit of track riding at the end of it. And for that the R nineT has largely delivered. Two things held it back though – the first, a lack of ground clearance which meant scraped hero blobs as the pace got higher and second, a lack of suspension control. For normal riding a stock Racer is fine, but push it really hard, and it the forks dive too fast, it bottoms out on the brakes and rebounds too quickly, triggering the ABS. 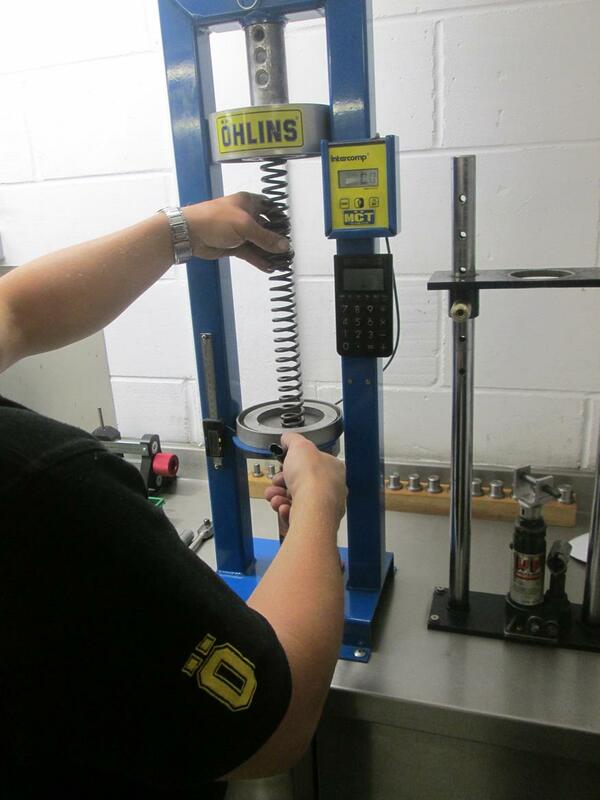 The rear shock doesn’t have enough compression damping or stiff enough spring either. I’ve already addressed rear-end problems with a Nitron NTR shock with a stiffer spring and a 5mm increase in rear ride height, plus Pirelli Supercorsa SP tyres, whose taller profile do the same to aid clearance, but now it was time to look at the forks. 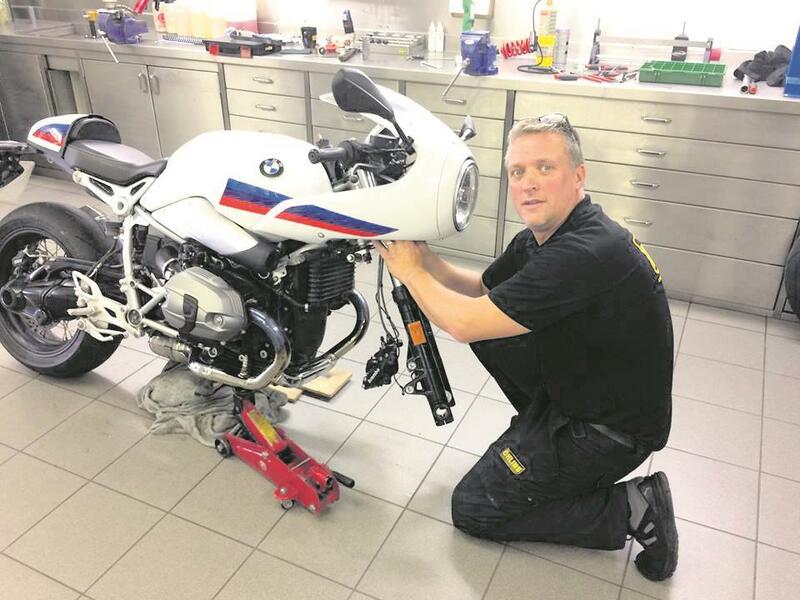 The R nineT’s forks are pretty basic damper-rod items. While modern sportsbikes have a cartridge system with intricately-shaped pistons and an array of shims that can be adjusted to alter rebound and compression damping, a damper-rod is much more basic, with a piston attached to a rod passing though the inside of the fork with a couple of small orifices at the end of the rod to regulate the flow of oil. 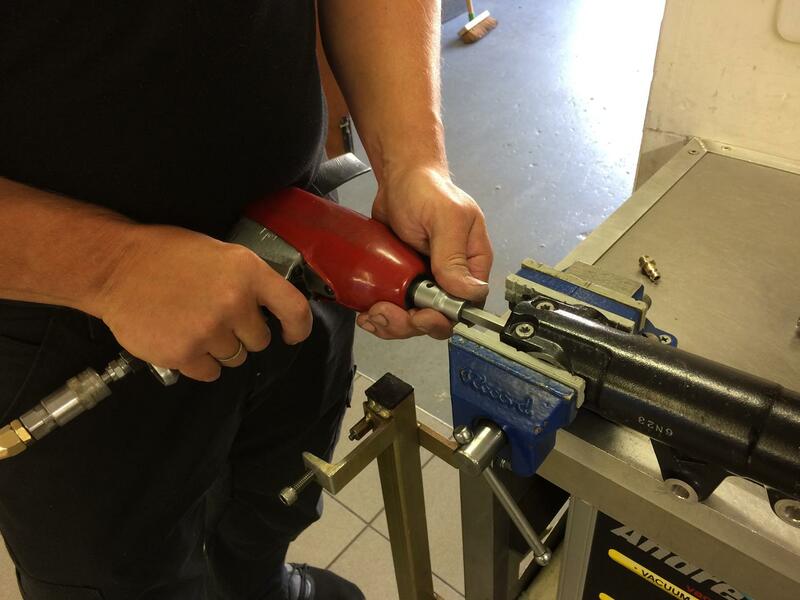 They’re much cheaper to make, but don’t offer the sophistication and adjustability of a cartridge kit. But that doesn’t mean they can’t be improved. I took the bike to Darren Wnukoski at MCT in Stowmarket. I’ve been using Darren for over a decade and he’s an expert at getting a machine working for the real world without trying a sell you a set of MotoGP-spec forks for popping to the shops. 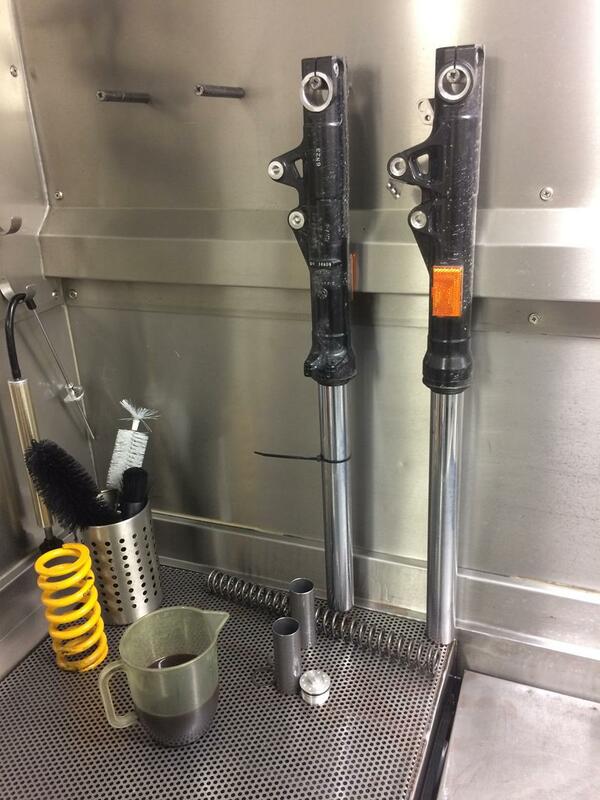 Darren wanted more compression damping, so thicker oil was the first change (we went for Motul Factory Line 15W). 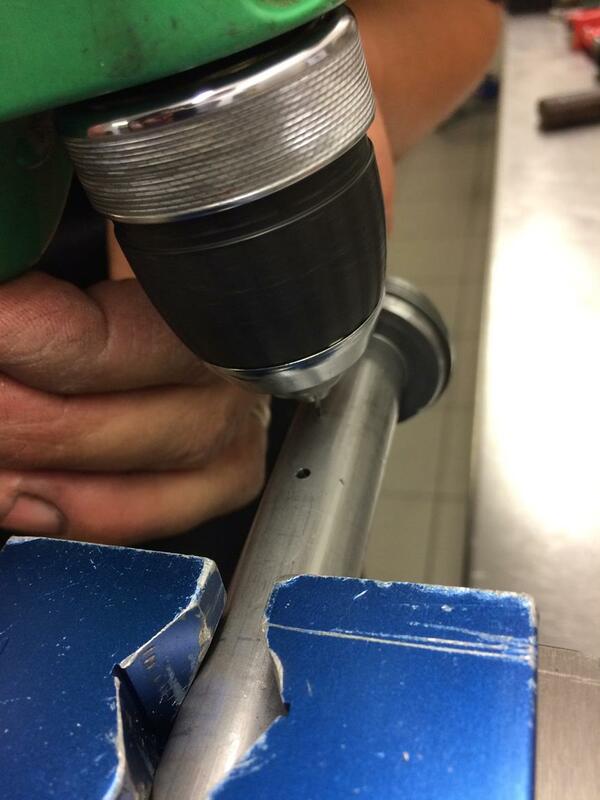 The problem is by increasing the thickness of the oil on a damper-rod fork you also in increase rebound damping as well, so Darren drilled another orifice in the damper-rod. Next were the springs. 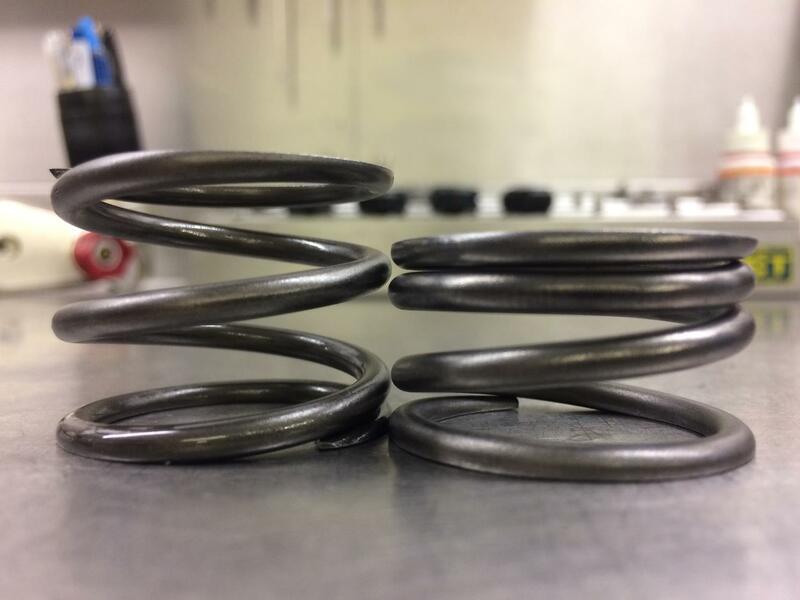 The standard fork spring was fine, but Darren wanted to increase travel, which he did by heating up and compressing the top-out spring, which sits below the piston and stops it bottoming out in the fork’s body. Shortening them by 10mm increases travel and front ride-height by a similar amount. New preload spacers needed to be cut to suit. After reassembly you could notice the difference straight away. The bike sat higher than before at the front, so we raised the rear ride-height to compensate, which is what I wanted to do anyway. The control on the brakes was far better, allowing you to trail-brake, the bike had lost the pitch and wallow it had before and it held a line far better than before. A huge improvement and very good value at £295 ride-in, ride-out, including a full suspension set-up.